EVANSTON, Ill. (AP) — The last time the stakes were this high for Northwestern, coach Pat Fitzgerald was a star linebacker on a team that captured the nation’s imagination. A Rose Bowl run snapped a string of 23 losing seasons and made the Wildcats a feel-good story in 1995. More than two decades later, No. 21 Northwestern is one win away from a return trip. The Wildcats (8-4, 8-1) are set to face No. 6 Ohio State in their first Big Ten championship game appearance on Saturday in what could be a signature moment for a consistent winner trying to earn its spot among the conference’s elite. With a 95-69 record in 13 years, Fitzgerald has nearly twice as many victories as any other Northwestern coach. The Wildcats have eight bowl appearances and three 10-win seasons under him. One thing missing during his tenure was a first-place finish. They changed that by winning the Big Ten West. And if they pull off the stunner against Ohio State, that would be another huge twist in a season that’s seen a few. 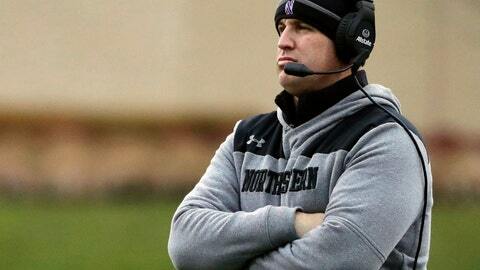 Northwestern is in this position despite dropping three in a row following a season-opening victory over Purdue. The Wildcats went 0-3 in nonconference play, with a loss to Akron. But if they take out that other Ohio school this week, they’ll get a ticket to Pasadena for the first time in 23 years. Though they’re a longshot to beat Ohio State, the Wildcats are on a roll. They’ve won seven of eight and their lone loss during that stretch was a tight one against a likely playoff team — by 10 to No. 3 Notre Dame on Nov. 3. Northwestern is 15-1 in its past 16 Big Ten games. And the Wildcats have won nine in a row away from Ryan Field, including a victory over Kentucky in the Music City Bowl last season. Even so, a win over Ohio State would be a big surprise. The Wildcats have dropped six in a row against the Buckeyes since a 33-27 victory in 2004 and 30 of the past 31 meetings. Win or lose, Fitzgerald sees a program in a good spot, with consistent success and sparkling new facilities. “Those are comfortable chairs, aren’t they?” he said. The stadium seats with cup-holders and desktops in the auditorium were part of a neat upgrade this year. Northwestern built a posh lakefront practice facility that included a massive weight room, sports medicine center, a virtual reality room that allows quarterbacks to watch 3-D video and an outdoor lounge. Another big bonus was this: Players no longer have to shuttle a mile to the facilities adjacent to Ryan Field. That’s a major timesaver for them. The new facility is obviously a major recruiting selling point. And it’s also a point of reflection for Fitzgerald, even as he looks toward the future. “Every time I walk into this building, I think of the guys in the ’70s and ’80s that didn’t have this type of support,” he said. “And the messages that I get from them all the time are … really important to me. I hope we represent that group the right way. I hope that group and those groups of men take pride in where the program is today. Did we get over a big hump and win the Big Ten West?